humor draws people in. She is approachable and available to everyone, and welcomes feedback." Bator echoes the sentiment and adds that, "Midge's experience in teaching and leading at every level, from elementary to high school, provides her with an understanding of the journey of a student, the expectations of and for faculty, and the extraordinarily difficult job of care givers in today's world. She is also dedicated to listening to and learning from those with diverse perspectives as they help inform what is best for each student." From a young age through today, where being a teammate was weaved into just about every facet of her life, Connolly believes in the collaborative process. "The more voices is most often the better," admits Connolly. "And I have an open-door style of leadership. If I tell you to come to me or call, I mean it." After an unexpected departure from the previous administrator, and decades preparing for this moment, Connolly was tapped by the School Committee for the superintendent position. A leader to help bring sta- bility to the role and move the district in the right direction, Connolly notes the "incredible welcoming" she received. "We have tremendous intellect and resources in the faculty, staff, and families that most com- munities don't have. In addition, organizations like the Weston Education Enrichment Fund Committee (WEEFC), the PTO, and Weston PAC are what make Weston truly unique," Connolly expounds. "There is a pas- sionate commitment of families for their children's education." 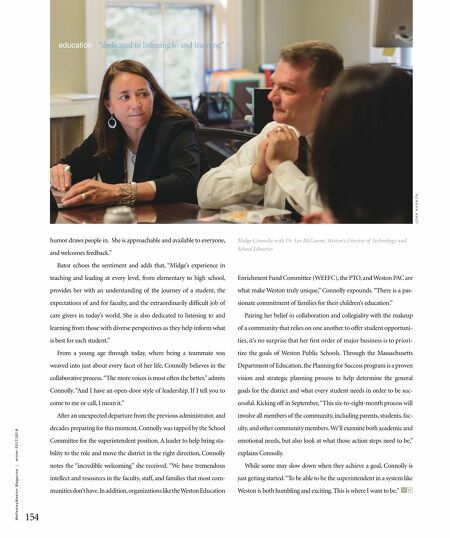 Pairing her belief in collaboration and collegiality with the makeup of a community that relies on one another to offer student opportuni- ties, it's no surprise that her first order of major business is to priori- tize the goals of Weston Public Schools. Through the Massachusetts Department of Education, the Planning for Success program is a proven vision and strategic planning process to help determine the general goals for the district and what every student needs in order to be suc- cessful. Kicking off in September, "This six-to-eight-month process will involve all members of the community, including parents, students, fac- ulty, and other community members. We'll examine both academic and emotional needs, but also look at what those action steps need to be," explains Connolly. While some may slow down when they achieve a goal, Connolly is just getting started. "To be able to be the superintendent in a system like Weston is both humbling and exciting. This is where I want to be." J O H N H A R M O N Midge Connolly with Dr. Lee McCanne, Weston's Director of Technology and School Libraries W e l l e s l e y W e s t o n M a g a z i n e | w i n t e r 2 0 1 7 / 2 0 1 8 154 education "dedicated to listening to and learning"